Hamlin is located nine miles northwest of Hiawatha in Brown County, Kansas. The development of the community was jumpstarted by the arrival of the St. Joseph and Grand Island Railroad in the early 1870s. Two churches were established - Congregational and Baptist - and they erected places of worship in Hamlin by 1887. The Brethren denomination followed soon after with the construction of their building in about 1895. The Brethren worshippers attended religious services in this building until 1948. They sold the property to the local Baptist congregation in 1951, which still owns and occupies the building. The building reflects a vernacular interpretation of the Gothic Revival style executed in wood materials - also commonly referred to as Carpenter Gothic. 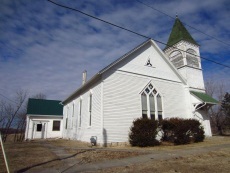 This is the only remaining church building in Hamlin, and it is nominated to the National Register of Historic Places for its local significance in the area of architecture. 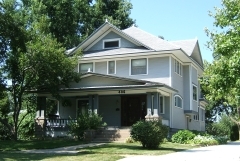 The Samuel Bierer House was built in about 1888 in a neighborhood of turn-of-the-century residences just two blocks north of downtown Hiawatha. Albert Lawrence, proprietor of the Hiawatha firm Bierer, Lawrence, and Company, built the house and sold it to his business partner in 1891. The two-and-a-half-story wood-frame residence exhibits an interesting blend of late 19th century Victorian stylistic influences with early twentieth century Craftsman updates. The original shed roof porch with Victorian-era spindlework was replaced in 1926 with the current low hipped-roof structure supported by short square wood porch columns typical of the Craftsman era. There is an historic limestone sidewalk with two hitching posts along the north side of the property. A two-car garage was added to the property southwest of the house in the 1920s. The property was nominated for its architecture. 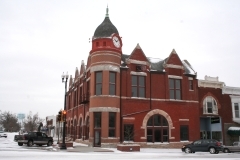 The Clock Tower Building was completed in 1892 and sits at a prominent downtown corner in Hiawatha. Harvey Ellis is believed to be the architect of this Richardson Romanesque-style building. It is two stories and features a red brick exterior with limestone decorative elements including window lintels and sills. Additionally, there is egg-and-dart brick molding above each second-story window and a three-story tower on the building's northeast corner. It was nominated to the state register for its architecture and for its local commercial significance. It is also a contributing building in the National Register-listed Hiawatha Courthouse Square Historic District. The Davis Memorial is located at the south end of Mount Hope Cemetery in Hiawatha. 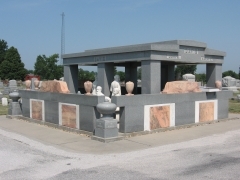 The memorial was established in 1931 when John M. Davis commissioned statues be built for his wife's grave; Sarah E. Davis had passed away in 1930. Over time John M. Davis added to the memorial. When finished, it consisted of a polished Vermont granite canopy supported by granite pillars, two granite figures on the memorial's exterior and nine other figures carved of Carrara marble. The figures depict John and Sarah Davis' lives together. The memorial is considered significant because of its uniqueness and artistic quality. 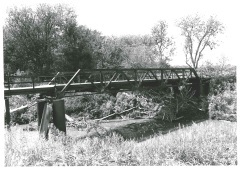 The Delaware River Warren Truss Bridge was built in 1913 by the Missouri Valley Bridge and Iron Company of Leavenworth, Kansas. The bridge carries Coyote Road across the Delaware River. It is constructed of a concrete foundation and steel structural elements. The riveted pony truss of the bridge measures 66.5 feet long and the concrete deck is 14 feet wide. The paired parallel guardrails are angled and intact along the length of the bridge. The bridge is significant for its role in local transportation history and for its engineering. The A.J. Eicholtz House was built in 1913. It features an American Foursquare plan, in the Prairie style, with Craftsman inspired oak details on the interior. The house has a limestone foundation, weatherboard cladding, asphalt roof, two red brick chimneys and a two-story bay window on the south elevation. The Eicholtz House is significant for its architecture. Hiawatha merchant Seward Graham built this transitional Queen Anne-style residence between 1895 and 1900. Graham operated a successful clothing business in Hiawatha with his brother Dilbert. 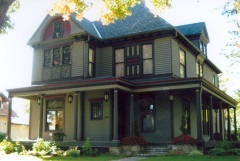 The two-story house is located seven blocks east of downtown and features an asymmetrical form with a dominant front-facing gable with decorative wood shingles and clapboard siding, a one-story porch with classical columns, a second-story covered balcony, bay windows, and original double-hung wood windows. 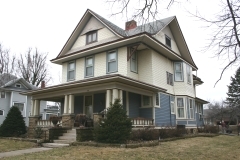 With elements of both the Eastlake and Free Classic styles, this house is nominated to the National Register for its architectural significance. 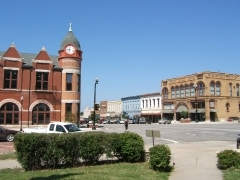 The Hiawatha Courthouse Square District flourished between 1872 and 1950 as the town developed into the largest community in Brown County. This district includes 61 buildings, historic street lights, and brick paved streets. Buildings are in various styles that reflect eras associated with the town’s development. The district is significant for its local commercial history. Architect Thomas W. Williamson designed the Hiawatha Memorial Auditorium, which was completed in 1920. 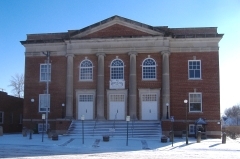 The space was used as a public auditorium until 1977, and remained vacant until 1980 when it was purchased by the Brown County Historic Society to be used as a museum and meeting hall. The building reflects elements of the Neoclassical Revival and Georgian Revival styles. The building is primarily red brick with stone trim. The main elevation features a full-height central portico with four Ionic columns. This building is locally significant for its architecture. 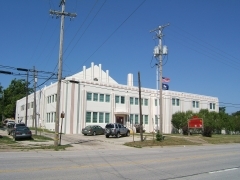 The Hiawatha National Guard Armory was completed in 1938. The building is in the PWA Modern style, a style used for many Public Works Administration buildings, which combined elements from the Art Deco and Modern Movement. The building has concrete foundation and walls and asphalt roof and utilized modern materials, steel and glass. In addition to serving as the headquarters for National Guard Units, it has hosted Naval Reserve Units and large community gatherings. The Hiawatha National Guard Armory was nominated for its statewide significance in the areas of architecture, military, and community planning and development.